In April 2010, Jim Tressel, head football coach at Ohio State, was informed by a credible source that several of his players broke NCAA rules by selling football-related paraphernalia. Tressel withheld that information from the NCAA and Ohio State until January 2011, when the university discovered the incriminating emails and disclosed them to the NCAA. In September 2010, Tressel signed a document attesting that he had no knowledge of any NCAA violations by his players. During the entire 2010 season, he played the players, knowing they were ineligible due to the violations. In December 2010, the university learned of the violations, investigated them, and Tressel still did not inform anyone that he had any knowledge. The Ohio State community has been defending Tressel. The most common defense is that everybody makes mistakes, Tressel has an excellent record of integrity, and one mistake does not overcome that record. They are right. People do make mistakes, and people with previously spotless records should generally be forgiven for isolated mistakes. Mistake: Kobe Bryant cheated on his wife by having a one-night-stand with a woman he had never met before. Not a mistake: Tiger Woods cheated on his wife by having ongoing affairs with 14 women over the course of years. The difference: Kobe Bryant is still with his wife. Mistake: Your neighbor builds a fence six inches on your side of the property line because of an unclear description in his deed. Not a mistake: You neighbor burns down your fence because it reduces the sunlight that gets to his elderberry bush. The difference: a small fine for trespassing vs. a felony conviction. This is not to say that all mistakes should be forgiven. Many (including this blogger) would argue that Kobe’s wife should not have forgiven him. However, the point is that mistakes are much more forgivable than intentional, calculated wrongdoing (especially over a long period of time). The record is clear that Tressel did not make a mistake. He intentionally covered up serious NCAA violations and misled investigators over the course of eight months. Ohio State must fire Jim Tressel. Earlier this week, the NCAA made public a notice of allegations that it sent to OSU. The notice instructs the university to explain why it should not be hit with major sanctions. There is little doubt that if Tressel had a .500 record against Michigan, he would have been fired a month ago. 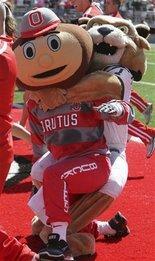 There does not appear to be any evidence that this cover-up involved any OSU officials other than Tressel. That means the university could fire Tressel, blame everything on him, argue that the university made its best efforts to comply with NCAA rules by ridding themselves of the problem and escape relatively lightly. However, they have not fired Tressel because he wins football games. In other words, at Ohio State, you can either have integrity or win football games. Both would be great, but if you can only do one or the other, make sure you win. After all, Tressel could have the most integrity in the world, but everybody knows that if he were .200 against Michigan, he would not be head football coach at Ohio State. Isolated mistakes by good people are generally forgivable. However, that adage is overused. The Tressel cover-up is a perfect example of something that was not a mistake and should not be treated like one. This entry was posted in sports and tagged jim tressel. Bookmark the permalink. 2 Responses to a mistake? As this is not a political post, normal bear rules do not apply.